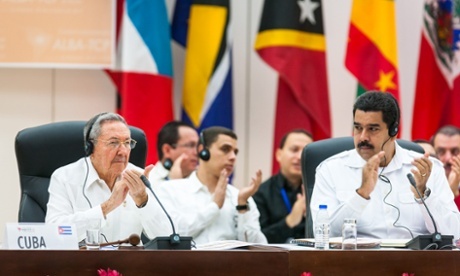 President Raúl Castro Ruz thanked the countries of Latin America and the Caribbean for their solidarity. April 14, 2015 -- Granma, posted at Links International Journal of Socialist Renewal -- It was high time I spoke here on behalf of Cuba. I was told at first that I could make an eight-minute speech; although I made a great effort, along with my foreign minister, to reduce it to eight minutes, and as I’m owed six summits from which we were excluded, six times eight, 48 (laughter and applause), I asked President Juan Carlos Varela [of Panama] a few moments before entering this magnificent hall, to allow me a few minutes more, especially after we have been hearing so many interesting speeches, and I am not only referring to that of President Obama, but also that of Ecuadorian President Rafael Correa, President Dilma Rousseff and others. Important achievements in earthquake rehabilitation were achieved with the public health initiatives taken by Haiti's Ministry of Public Health in cooperation with large international missions and many smaller, vital health care projects. The contributions of Cuba and Partners In Health stood out. For more on Haiti, click HERE. For more on Cuba's health system and its assistance to other countries, click HERE. November 24, 2014 -- Antipodean Atheist, posted at Links International Journal of Socialist Renewal with the author's permission -- The head of the World Health Organization (WHO), Dr Margaret Chan, was speaking about the terrible crisis afflicting the poor West African countries Liberia, Guinea and Sierra Leone, namely, the growing outbreak of the Ebola virus disease. This condition is a fatal disease, transmitted from undomesticated animals to people, and is transmitted by contact with the bodily fluids of an infected person. Havana took up the challenge by hosting a special Summit on Ebola with its regional partners and global health authorities on October 20. October 24, 2014 -- Guardian Professional -- West Africa needs what Cuba has: a well-trained, coordinated healthcare system. Anything less and Ebola wins. Doctors from all over the Third World are trained for free at the Latin American School of Medicine in Havana, which is one of the world’s most advanced medical schools. 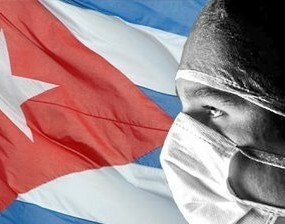 September 22, 2014 -- France 24 -- Cuba is joining the fight against Ebola by sending a 165-strong army of doctors and specialists to West Africa. Despite decades of financial hardship, the communist country remains at the forefront of the world’s medical expertise and know-how. The team, which includes doctors, nurses, epidemiologists and intensive care specialists, is due to touch down in Sierra Leone in the beginning of October. January 21, 2014 – Links International Journal of Socialist Renewal -- Samuel Farber has recently written an article on “The Future of the Cuban Revolution”. This article contains some useful information on “the emergence of new tendencies and debates” in Cuba. But Farber’s article is fundamentally flawed. It contains not a single word about the 55-year-long campaign by the United States government to overturn the Cuban revolution! August 3, 2013 -- Australia-Cuba Friendship Society -- Excerpts from some longer documentaries by Tim Anderson on Cuban health cooperation with Timor Leste, Vanuatu, Nauru and the Solomon Islands. Also a short excerpt from Nauru Television. For more on Cuba's health system and its assistance to other countries, click HERE. July 19, 2011 -- Monthly Review Press has kindly given permission to Links International Journal of Socialist Renewal to publish an excerpt from one of their latest books, Revolutionary Doctors: How Venezuela and Cuba are Changing the World’s Conception of Health Care by Steve Brouwer. You can download the excerpt HERE (PDF), or read it on screen below. 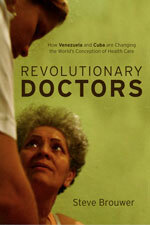 Readers of Links are also urged to purchase copies of Revolutionary Doctors; click HERE to order. 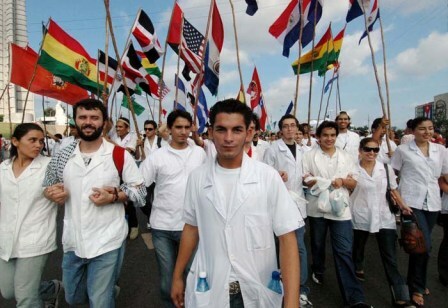 Students from Latin American School of Medicine march on May Day in Havana 2006. Photo by Bill Hackwell/Havana Times. May 18, 2011 – Links International Journal of Socialist Renewal, an earlier version of this article first appeared at Monthly Review in March -- A revolution can only be successful when the new generation takes over from the old. When thousands of students come together because of their dedication to helping others at a school that was built to allow them to fulfill their goals, the ground is fertile for students to continue the struggle.